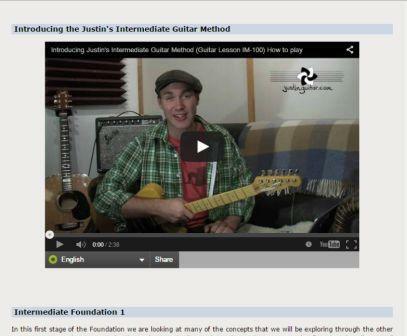 As part of my free online guitar lessons series this review is going to look at the Justin guitar lessons on Justinguitar.com. First of all I commend Justin for offering completely free guitar lessons – and, as you’ll see below, a pretty decent amount and quality too. Whilst there is an option to provide a donation on the website, this is up to you whether or not you do. I was very impressed with how much you get in Justin’s beginner course. Yes it only covers very beginner stuff but does it very well. The course is split into 10 stages (‘getting started‘ and then stages 1 – 9). There is nothing in the beginner course that you have to pay for but you are encouraged to donate. And fair enough too. If you can’t afford to pay then this is a great way to get free lessons. If you can afford to pay and you like the lessons then it’d be great to make a donation to keep the lessons free for others. Who would the beginner course be best suited to? This course is suited to anyone who is picking up the guitar for the first time or for anyone who has some basic knowledge but might want to improve their technique. It would also be good for any self-taught guitarists that wanted to go through the lessons to see if there is anything that fills in any gaps in their playing they might have missed. Justin’s intermediate method is broken down into 5 ‘Foundations’. These lessons build the foundations needed to play any style. The idea of these is to build the techniques you will need to develop whichever styles of music you want to go into. Again I found the lessons to cover a lot and what you get for free is really great. There are some extra DVDs you can buy in the intermediate lessons. These are optional but I guess it means you aren’t getting absolutely everything for free. But what you do get is quite a lot. Who would the intermediate course be best suited to? Anyone who has completed the beginner course – or anyone who is at a level having mastered the basics of guitar in a well structured way – i.e. you have completed online or in person beginner guitar lessons and are very confident that you have the basics mastered. I would still encourage anyone who hasn’t had structured lessons to go through the beginner course first. If you have been playing guitar for a while you will cruise through it really quickly and it might just fill in a few missing pieces. I found that Justin’s teaching style is very clear and easy to understand. He also provides subtitles for all of his lessons, even English subtitles in case you can’t understand his accent! Personally I had no trouble understanding his accent and he spoke clearly enough for me. But if there were any words you weren’t sure of there are subtitles. I found in some of the lessons it feels like it takes a little while for him to get to a point but I’m being really picky now (and I know I’m the same a lot of the time!). And this is also probably partly to do with the fact that I was going through beginner lessons and when you know the stuff it can feel a bit slow. On top of that it’s better that the lessons run a little slow than if they were to go too fast. Although being online video lessons you can always pause and repeat stuff if you need to. Don’t be fooled by this guy’s young appearance. He’s obviously been doing this for some time now and seems to have a good deal of knowledge and has developed a well structured set of lessons over that time. As I have said I am very impressed with what you get here for free and how well organized the lessons are. The lessons are really thorough and particularly through the beginner course I can’t think of too many things he’s left out. The style modules are still a work in progress but the beginner and intermediate lessons are the best I have seen that are free. Now, I have only just started reviewing online guitar lessons so I may find better ones but I think, as far as free lessons go, Justin’s lessons will be tough to beat. If you aren’t in a position to pay for guitar lessons – either online or in person lessons – then Justin’s lessons should be your first point of call. If you can afford to pay for lessons then that certainly doesn’t mean you shouldn’t check out Justin’s site. The lessons are still really great and worth checking out – I just encourage you to donate what you think is fair. Thanks for reading and if your keen to check out Justin’s website I encourage you to do so. I hope this review has helped you decide whether or not to try out his lessons.